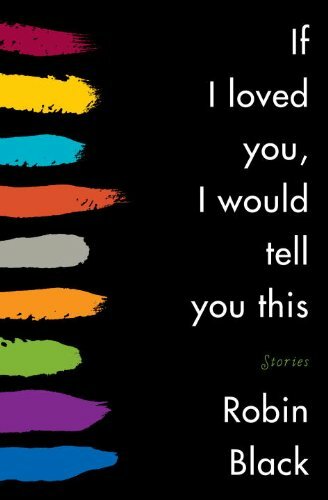 After reading the first story in Robin Black’s collection If I Loved You, I Would Tell You This , I thought, “not bad.” Despite the occasional clumsy pieces of dialogue (“It’s a… Dammit, I think we’re lost. No, wait, this must be right,” is too thick and verbally thoughtful for a story whose main character is quiet and self-reflective) and seemingly superfluous details (knowing all the characters’ last names, without really knowing why we know), I finished “The Guide” ready to dive into the nine remaining stories. In the next story, “If I Loved You,” a woman tells her neighbor, without really telling him, all the reasons why building a fence at his property line will impact her life: the fence impacts her view of the trees and makes it impossible for her to exit the passenger side of the car when it’s pulled into the driveway. These are seemingly small things until we learn that, with the car parked at the curb, she will have to climb into a wheelchair and wait for her husband to push her to their house because she is dying of cancer and can no longer walk the length of the drive. The neighbor’s fence eventually becomes the one tangible thing she can fight, something she can possibly control. The story is pieced together in small chunks, a few paragraphs at a time, and is a good reminder of our willingness to judge one another’s actions and intentions without access to the whole truth. “If I Loved You” scored a mark in my mental notebook of “great short stories” and with eagerness I turned to the next in the collection, expecting Black to land a few more in that mental notebook and maybe even score one in my “phenomenal short stories” list. In “Immortalizing John Parker,” an near-octogenarian former homemaker turned painter muses on the passing of time and the inevitability of death while dispensing trite advice such as, “Time makes fools of us all. Every single one of us.” The story “Gaining Ground” ends with a limerick about the narrator’s mentally ill, suicidal father. In the final story, “The History of the World,” a woman who survives a car accident that kills her twin brother is relieved of her survivor’s guilt by—who else? —Eve, one-half the genesis of self-knowledge that banned humankind from Eden, the one with whom (if you believe in the Christian Bible or grew up in Kansas) the history of the world begins. Black’s characters cycle through the same two or three voices, regardless of their backgrounds, with most eventually sounding like a 40-something women who have come to some personal revelation about their lives, even when the characters are 40-something men estranged from their daughters or children with murderous aspirations. Without the drive of individual voices, each story looses its distinguishing characteristics and the patterns Black repeats in each story are obvious—1. hook the reader in with a unique anecdote (Anne Boleyn, wooden legs, whatever); 2. move to the real action of the story (broken domestic scenes); 3. dangle the moment of revelation in a quick, three paragraph ending where the character, and by extension the reader, comes closer to the truth of human existence. The mechanics of a story laid bare erases the magic of reading stories. It’s like watching a play from backstage. Sure you know how it’s done, but wouldn’t you rather suspend that disbelief? Black tries too hard to pack a moment of truth—excuse me, Truth—into each story. The result is hollow. Note: In accordance with FTC guidelines, this book was received free through a Goodreads promotion. The Pen/O.Henry Prize Stories are twenty short stories from literary magazines as well established as The New Yorker to the lesser-known Grain and Five Points. It’s always risky to pick up a collection of short stories by various authors because, unlike collections by a single author, the quality across the collection isn’t guaranteed. Different writers, different styles, different ways of telling a story can mean a wildly varied hodgepodge similar to those Bertie Bott’s Every Flavor Jellybeans: one handful tastes like delicious cotton candy and popcorn at first and then you realize you’re also eating the unappetizing snot and dirt beans too. Fear not: from Junot Diaz’s lingering “Wildwood,” about an immigrant’s daughter coming to terms with herself and her mother; to Andrew Sean Greer’s “Darkness,” about what is burned, and therefore lost, in a postapocalyptic world; to Marisa Silver’s “The Visitor,” about a young woman and her grandmother working to repair failed relationships, these stories are undeniably terrific from start to finish. Read about other great books in our reviews section or submit your own!